Its always a dream for humanoid robot builders to replicate human running style. Although legged running robots have been built in the past, most of them don't have knees. The one's with knees can't run very fast; A good example is the Honda Asimo which has knees but it can only walk steadily and run upto 6 Km/hr, although I would like to say its one of the best humanoids ever built. A robot developed at the University of Michigan lab can run like a human with features that represents the height, agility and efficiency of humans for a two-legged machine. With a peak pace of 6.8 miles per hour or 10.94Km/hr, MABEL is believed to be the world's fastest bipedal robot with knees. 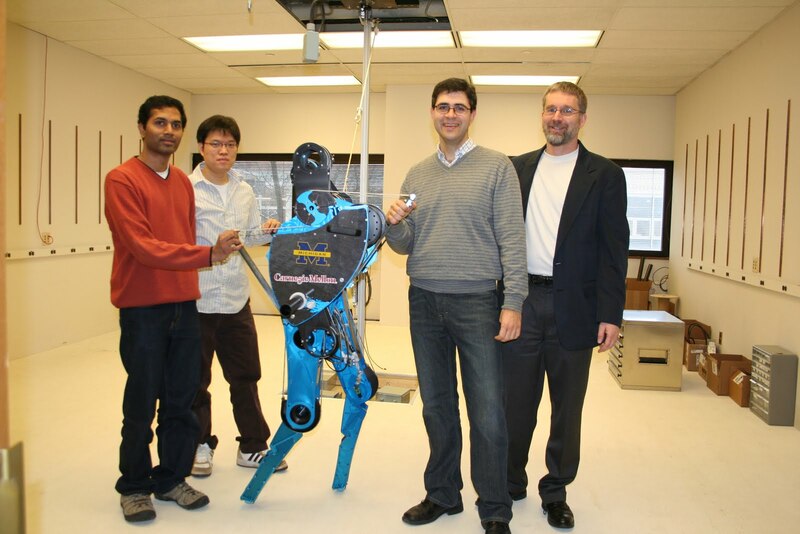 Mabel was a project that was built back in 2008 with collaborating members which include Jonathan Hurst, a doctoral student at the Robotics Institute at Carnegie Mellon University, Jessy Grizzle a professor at U-Mich. Doctoral students, Koushil Sreenath who is in the U-M Department of Electrical Engineering and Computer Science. Hae-Won Park is in the U-M Department of Mechanical Engineering the later have contributed to developing the Algorithm and model for the robot. Since then the team has been progressively improving the feedback algorithms that enables the robot to keep its balance while reacting to its environment in real time. MABEL was designed back in 2006-2007, and was actually built in 2008. The great thing about this machine is that it has a body with a rough human weight distribution and springs that act like tendons in the human body. MABEL weighs over 65 Kgs, has a heavy torso that weighs about 40 Kgs and has point feet, It operates on a cable-driven transmission system with compliance. MABEL is powered by four electric motors, two for each leg . Whether the robot is walking, running, or just standing, there is a feedback controller on a computer that measures all of the positions of the robot's joints and the angle of its body, and then determines the proper power commands to send to the motors to do the desirable task. To sum it all up you might ask, what's the use of this technology in the first place? The simple answer is for Robots to integrate with humans its really important that they move, run and walk just like humans. It has many potential applications in developing better exoskeletons that are already helping wheelchair-bound people to walk again or that give rescuers, soldiers super-human abilities. It is also useful in developing powered prosthetic limbs that behave just like their biological counterparts. It may also be used as an alternative form of transport for the future. MABEL is a project funded by the National Science Foundation (NSF) and DARPA (Defense Advanced Research Projects Agency).